A shofar (IPA: [ˈʃoʊfər]—Heb: שופר) is a horn that is used as a musical instrument for Jewish religious purposes. It is intimately connected with both Rosh Hashanah and Yom Kippur. In biblical times the shofar was used as a signaling device in time of war, most famously at the Battle of Jericho. It later served as an accompanying instrument for the performance of psalms in the Temple of Jerusalem. Since the destruction of the Temple in 70 C.E., it has played a more restricted role in Jewish religious life. The method of playing the shofar is similar to that of bugle, with pitch variations created by adjusting the lips while blowing (varying the embouchure). The shofar is usually constructed from a ram's horn, although the horns of many other animals are also accepted. It is considered an instrument for sacred use, and the manner of playing it is closely prescribed in Jewish tradition, although some innovative uses of the instrument have been made in recent years. 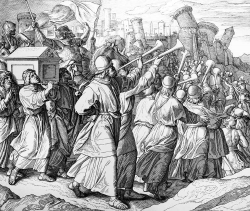 Priests blow shofars in preparation for the attack on Jericho. 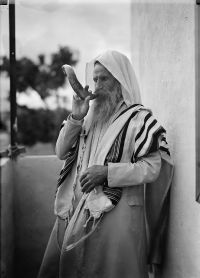 The shofar, usually translated as "trumpet," is mentioned frequently in the Hebrew Bible and throughout the Talmud and later rabbinic literature. On the morning of the third day there was thunder and lightning, with a thick cloud over the mountain, and an exceedingly loud trumpet blast. Everyone in the camp trembled. Then Moses led the people out of the camp to meet with God, and they stood at the foot of the mountain. Mount Sinai was covered with smoke, because the Lord descended on it in fire. The smoke billowed up from it like smoke from a furnace, the whole mountain trembled violently, and the sound of the trumpet grew louder and louder. Then Moses spoke and the voice of God answered him (Exodus 19:16-19). The shofar was often taken out to war so the troops would know when a battle would begin (Num. 10:9, Josh. 6:4; Judges 3:27; 7:16, 20; I Sam. 8:3). Most famously, seven shofars were blown in the time of Joshua to help him capture Jericho. As the Israelites surrounded the walls, the shofars were blown by the priests. Finally, the walls collapsed, and the Jews were able to capture the city. On the seventh day, they got up at daybreak and marched around the city seven times… The seventh time around, when the priests sounded the trumpet blast, Joshua commanded the people, "Shout! For the Lord has given you the city! …At the sound of the trumpet, when the people gave a loud shout, the wall collapsed; so every man charged straight in, and they took the city (Josh 6:15-21). On New-Year's Day (Rosh Hashanah) the principal ceremony in the Temple of Jerusalem was conducted with the shofar, which was placed in the center of the orchestra, with a trumpet on either side. This shofar was the horn of a wild goat, straight in shape, and ornamented with gold at the mouthpiece. On fasting days, the principal ceremony was conducted with the trumpets in the center and with a shofar on either side. On those occasions, the shofars were rams' horns curved in shape and ornamented with silver at the mouthpieces. On Yom Kippur of the jubilee year the ceremony was performed with the shofar as on New-Year's Day. In post-biblical times, the shofar continued to announce the new year and the new moon, to introduce the Sabbath, to begin the holiday celebration of Rosh Hashanah, and to mark the end of the day of fasting on Yom Kippur. The military and other musical uses have been generally discarded. 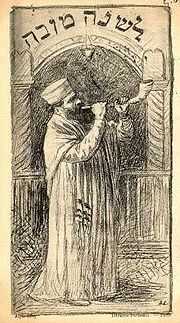 In the era after the destruction of Temple, the Halakha (Jewish law) holds that the shofar may not be sounded on the Sabbath, due to the potential that the shofar sounder may inadvertently carry it to the synagogue, which is forbidden as work on the Sabbath. For a while, the sounding of the shofar on the Sabbath was restricted to the place where the great Sanhedrin (Jewish legislature and court) was located. When the Sanhedrin ceased to exist, the sounding of the shofar on the Sabbath was discontinued. According to traditional Jewish law, women and minors are exempt from the command to hear the shofar-blowing at certain prescribed times, but they are welcome to attend the ceremony. In Orthodox tradition, women may not act as shofar blowers, but other traditions sometimes allow this. According to Maimonides, the shofar message is: "Wake up from your sleep. You are asleep. Get up from your slumber. You are in a deep sleep. Search for your behavior. Become the best person you can. Remember God, the One Who created you" (Mishneh Torah, Laws of Repentance 3:4). The shofar may be the horn of any animal, except that of a cow or calf, in deference to the biblical golden calf incident. Traditionally, the preferred horn is that of a ram. Some rabbinical authorities hold that the horn can even be made form a non-kosher animal. Bovine horns are made of keratin, the same material which forms the human toenail or fingernail. An antler, on the other hand, is not a horn but solid bone. Such antlers are not used for shofars because they cannot be hollowed. The Elef Hamagan (586:5) delineates the order of preference: 1) Curved ram's horn, 2) curved horn of other types of sheep, 3) curved horn of other animals, 4) straight ram's or other kosher animal's horn 5) the horn of a non-kosher animal 6) cow horn. The horn is flattened and given a turned up bell by applying heat to soften it. A hole is made from the tip of the horn to the natural hollow inside. If a shofar has an unintentional hole or tear affecting its sound, it becomes unfit for ceremonial use. A shofar may not be painted with colors, but it may be carved with artistic designs. A shofar made from the horn of a kudu, in the Yemenite Jewish style. The shofar is played much like a European brass instrument, with the player applying his lips to this hole, and causing the air column inside to vibrate. Shofars used in Ashkenazic Jewish worship tend to have no carved mouthpiece. The player applies his lips directly to an irregular hole drilled in the tip of the horn. Sephardic Jewish shofars, on the other hand, usually do have a carved mouthpiece resembling that of a European trumpet or French horn, but smaller. Because the mouthpiece is of irregular bore, the harmonics obtained when playing the instrument can vary: Rather than a pure perfect fifth, intervals as narrow as a fourth, or as wide as a sixth may be produced. The two basic sounds of the shofar are known as tekiah and teruah. They are of relatively low and high pitch, respectively. The tekiah is a plain deep blast ending abruptly; the teruah, a trill between two tekiahs. These sounds, constituting a bar of music, were rendered three times: First in honor of God's kingship, next to recall the Binding of Isaac, and a third time to comply with the law regarding the shofar. A third sound, the shevarim is a tekiah broken into three one-second segments. The duration of the teruah is equal to that of the shevarim; and the tekiah is half the length of either. Ten appropriate verses from the Bible are recited at each repetition, which ends with a benediction. Over time doubts arose as to the correct sound of the teruah. The Talmud is uncertain as to whether it means a moaning or a staccato beat sound. The sequence of the shofar blowing is thus: Tekiah, shevarim-teruah, tekiah; tekiah, shevarim, tekiah; tekiah, teruah, and then a final blast of tekiah gadola which means "big tekiah," held as long as possible. This formula is repeated twice more, making 30 sounds for the series, with tekiah being one note, shevarium three, and teruah nine. This series of 30 sounds is repeated twice more, making 90 sounds in all. In addition to these three repetitions, a single formula of ten sounds is rendered at the close of the service, making a total of 100 sounds. According to the Sephardic tradition, a full 101 blasts are sounded, corresponding to the 100 cries of the mother of Sisera, the Cannanite general who did not make it home after being assassinated by the biblical heroine Yael (Judges 5:28). One cry is left to symbolize the legitimate love of a mother mourning her son. The expert who blows (or "blasts" or "sounds") the shofar is termed the tokea (lit. "Blaster") or ba'al tekia (lit. "Master of the Blast"). Qualifications include someone who is learned in Torah and God-fearing. Every male Jew is eligible for this sacred office, providing he is acceptable to the congregation. If a potential choice will cause dissension, he should withdraw his candidacy, even if the improper person is chosen. In non-Orthodox congregations, females may also be eligible. Today, the shofar is used mainly on Rosh Hashanah and Yom Kippur. It is blown in synagogues to mark the end of the fast at Yom Kippur, and blown at four particular occasions in the prayers on Rosh Hashanah. 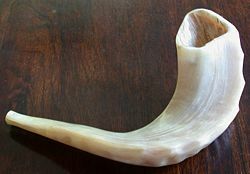 The Hebrew month preceding Rosh Hashanah, Elul, is designated as a month of introspection and repentance, and the shofar is blown at the end of morning services on weekdays (except for the eve of Rosh Hashanah itself). Shofar blasts are also used during penitential rituals such as Yom Kippur Katan and optional prayer services called during times of communal distress. The exact modes of sounding can vary from location to location. During the Ottoman and the British occupation of Jerusalem, Jews were not allowed to sound the shofar at the Western Wall. After the Six Day War, Rabbi Shlomo Goren famously approached the wall and sounded the shofar. More recently, Rabbi Mordecai Waldman has sounded the shofar at several gatherings of the Unification Movement, at which representatives of the three Abrahamic faiths—Judaism, Christianity, and Islam—have transcended differences to join in prayers for peace. The shofar has sometimes been seen in western classical music on a limited number of occasions. The best known example is to be found in Edward Elgar's oratorio The Apostles, although an instrument such as the flugelhorn usually plays the part instead of an actual shofar. In the musical Godspell, the first act opens with a cast member blowing the shofar, in preparation to singing "Prepare Ye the Way of the Lord." Barbarossa, Jim. The Ministry of the Shofar. Valparaiso, IN: Step by Step Ministries, 2000. ISBN 978-0967638065. Finkle, Arthur L. The Easy Guide to Shofar Sounding. Los Angeles: Torah Aura Productions, 2002. ISBN 978-1891662225. Miller, Malcolm. "The Shofar and Its Symbolism". Historical Brass Society Journal 14, 2002. Retrieved February 4, 2019. All links retrieved February 4, 2019. This page was last modified on 23 February 2019, at 17:40.